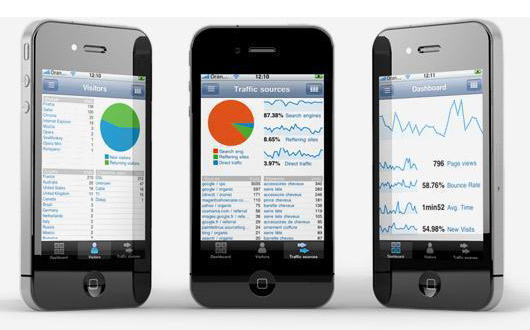 Did you know you can set up Google Analytics for your eCommerce app? That’s right. Just as you use it for your website, you can track and measure data about how people find and use your app. In this guide we will show you exactly how to achieve a flawless integration, but before we do so, we’ll explain why you need Google Analytics for your eCommerce app. 1. Why do you need Google analytics for your eCommerce app? By using this data, you will know which channels work best for you, and you will have the opportunity to adjust your campaigns accordingly to increase your downloads and get more users. Understand which marketing campaigns trigger higher engagement & sales: Google Analytics also helps you to understand how people use and navigate through your app. You will see which marketing channels bring the highest engagement, conversion and sales. 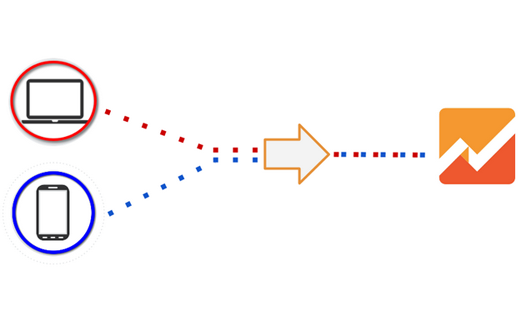 You will learn which push notifications triggered more opens and work better. By doing so, you will be able to analyze and compare campaigns, with learning how to increase your revenue as the end goal. Understand which products people viewed the most: The products that people viewed the most are the ones you should pay special attention to. You know there is already an interest in these items, so you must try to promote them more and set up campaigns to increase conversions. Understand which products people bought the most: With Google Analytics you can easily see your best-selling products and understand why they’re performing so well. Later on, you can use this knowledge to improve the sales of other products in your store. Just like with the most viewed products, you can set up special campaigns for your best-selling products to increase your revenue even more. Understand how to adjust your marketing efforts to improve conversions and sales: By tapping into the data from Google Analytics you will learn exactly what works for you and what doesn’t. You will know which channels and marketing activities lead to higher conversions and sales. You will be able to pinpoint exactly where you need to focus on increasing results and the biggest conversion killers stopping you from achieving (even greater) success. 2. What can you measure? Screen tracking: Screen tracking measures the various screens that users visit within your app. This includes what people are seeing, which ones are most popular, how long they stay on each screen, and how they navigate from one screen to the next. This is incredibly useful because it allows you to understand what type of content performs best and which products get the most views. With the use of goal and eCommerce tracking, you can analyze the performance of your conversion funnel and how many people pass through each level before they reach your shopping cart. If there is a screen with a huge drop off, this means there are some issues with that screen and you need to focus your efforts to improve it. It’s important to notice that screen tracking collects data only about the screen itself, not about the actions people take. For that, you will use event tracking. To track an event, you must set up tracking in your account and then attach a method call to the particular event you’d like to track. eCommerce tracking: eCommerce tracking allows you to understand performance and activity for individual products or product categories. It also provides you with data about your customers’ shopping behavior, such as how often they add or remove products to their shopping cart. The product performance report shows you the sales performance of all your products. You can filter and organize your reports based on product names, SKU, category, brand, etc. You can use the product list performance report to understand how each item performed on your app when it comes to views, clicks, CTR, etc. These reports allow you to see how people move through your conversion funnel. You will see details about how users viewed products, added them to shopping carts, initiated or abandoned the cart, and completed transactions. To use these reports, you’ll need to implement Enhanced eCommerce on your app. Before you set up Google Analytics for your eCommerce app, you’ll need to spend some time figuring out exactly what you’d like to track and measure. This will guide you through all the data you’ll likely want to collect and the reasons for doing so. Remember: the main reason you collect data is to improve your business results. So you should be specific about why you want to track something. 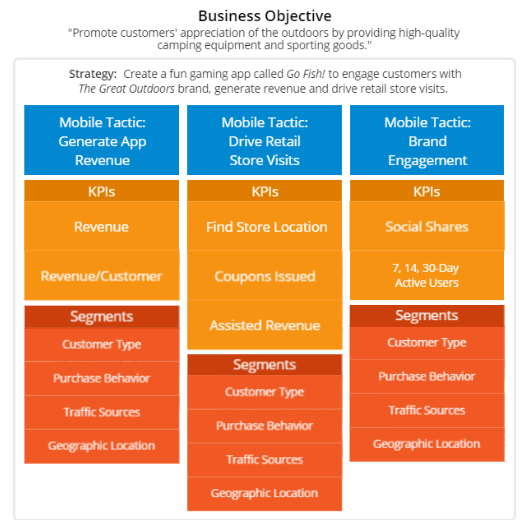 Define your business objectives: The most important thing is to understand your goal with your eCommerce app. For most businesses, it is a way to increase revenue from mobile users. Your main objectives might be increasing downloads, engagement, conversions and sales. Create strategies and tactics to support your objectives: Use strategies and tactics to achieve your objectives, such as the development of the mobile app itself, which provides a better user experience for mobile users. Specific tactics might be advertising campaigns on AdWords or AdMob to increase downloads of the app, or setting up a push notification campaign to increase engagement and conversions. Choose the right KPI to measure success: If you’re not measuring your progress, you’ll never know if you’re moving in the right direction. To identify how successful you are with your current strategy, you’ll need to define the right KPIs that matter for your business. It’s also important to know the difference between actionable vs vanity metrics. Set up targets for each KPI: Measuring KPIs alone is not enough to define success. You also need to have a specific target that you’d like to reach within a certain timeframe. For example, you might want to increase your mobile app users from 5000 to 10,000 within the next two months or increase your mobile conversion rate from 0.75% to 1% within the next three months. 4. How to set up a tracking code for your App? The first thing you’re going to need is a Google Analytics account. If you don’t have one, you can create one by clicking on the above link. 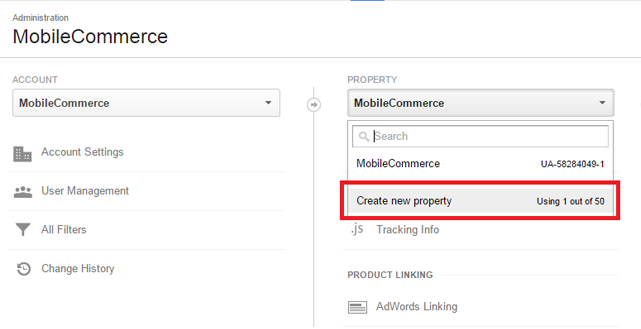 Set up a new mobile app property: In Google Analytics, you’ll need to set up a new app property for every app you want to track. Then a tracking ID is automatically generated for each property. To do so, just go to the admin tab and select the account to which you’d like to add the new property. Under the property column from the dropdown menu, select Create new property. Select mobile app, fill out the data and get your tracking ID. 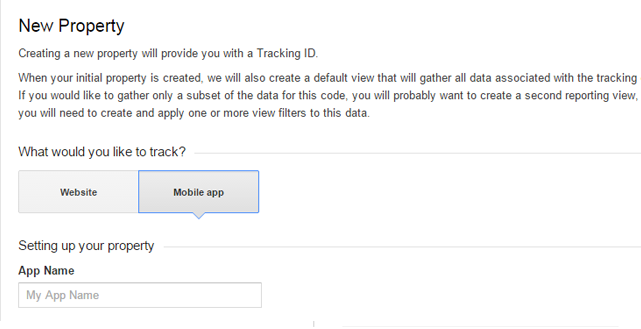 Set up the tracking ID for your app: To start collecting data for your eCommerce app, you’ll need to install one of the Software Development Kits (SDKs) that connect to the Google Analytics APIs. Setting up the tracking will differ depending on the mobile platform you’re using. 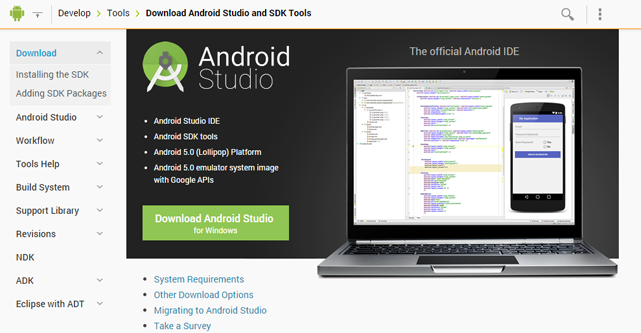 The first thing you’ll need to do is download the Android SDK. To use it, you need the following: 2GB of RAM, 4GB recommended 400 MB hard disk space + at least 1 G for Android SDK, emulator system images, caches, and Java Development Kit 7. You also need the Play Services SDK, which provides access to other Google services such as Google Analytics and Google Play APIs. The next step is to link your Google Analytics account to AdMob. If you haven’t created your AdMob account yet, you can do so from here. By doing so, you will automatically create an AdWords and AdSense account. Use AdMob to associate your account with your app in any apps marketplace. Then set up your tracking ID by creating a new ID or linking to an existing account. Normally you will start seeing the Google Analytics data within 24 hours. If you don’t, make sure to review all steps once again to be sure that you have set up everything properly. By setting up Google Tab Manager for Android you’re able to add and update data collection tags in your app tracking without having to release a new version for your app. To track an iOS app, you‘ll need a Mac computer with OS X 10.8 or later and Xcode, which includes iOS SDK. For iOS apps you will also need Google Analytics SDK for iOS in order to measure and track meaningful data like active users, actions, goals, in-app purchases, crashes, etc. Create your AdMob account (if you haven’t already) and link it to your Google Analytics account. Use AdMob to associate your account with your app in any apps marketplace. Then set up your tracking ID by creating a new ID or linking to an existing account. With Google Tag Manager for iOS you’re able to easily add and update data collection tags in your app for tracking without having to release new versions of an app. Setting up Event tracking depends on the platform you’re using. How to set up event tracking in Android: Each event consists of four parameters that describes it. Check out the Advanced Configuration for details on getTracker method. How to set up event tracking in iOS: Each event consists of four parameters that describes it. 6. How to set up eCommerce tracking? Follow these steps to start tracking important eCommerce data from your app. 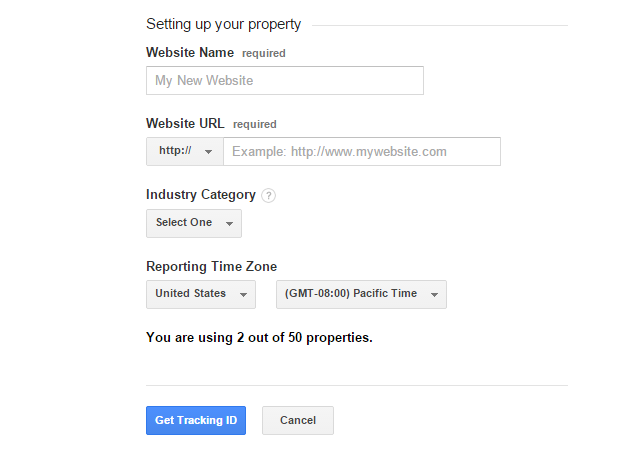 Enable eCommerce tracking: Go to Google Analytics -> Admin and select the view for which you want to enable Enhanced Ecommerce reporting. In the view column, select Ecommerce Settings and set the status for Enable Ecommerce and Enhanced Ecommerce Settings. Set up labels for the check-out steps to create a meaningful funnel visualization. They will appear later on in the Checkout behavior report. Set up Enhanced eCommerce tracking for Android: You will need to use the HitBuilder class to send eCommerce data for products, impressions and promotions. In addition, you can also use a set of Google Analytics eCommerce classes. To learn more about how to push this data to Google analytics, check out the advanced eCommerce tracking guide for Android. To learn more about how to push this data to Google analytics, check out the advanced eCommerce tracking guide for iOS. Setting up Google Analytics for your eCommerce app might require some time and effort, but it’s certainly worth it. Most of the features can be easily executed even by people who aren’t especially technically savvy. To do enhanced analytics the right way, we suggest you hire a developer to help you out with setting up tracking for products, impressions, promotions and currency. Once it’s done, you will be able to track, analyze and improve the performance of all your products.